What if a brain scan could detect the presence of a mental disorder even before symptoms have emerged? Or predict which depressed patients would respond to a particular medication and which would not? Or determine the likely rate of progression of Alzheimer's? Ying Guo is working to transform such aspirations into reality using math. Really, really sophisticated math. Guo is director of the Center for Biomedical Imaging Statistics (CBIS). CBIS drives research and ultimately clinical practice by developing specialized statistical techniques tailored for data collected through biomedical imaging studies. The center includes another core faculty member—Suprateek Kundu—several affiliate faculty members, an application developer, postdoc fellows, and doctoral students in biostatistics. The center often collaborates with researchers, many from the school of medicine, who are trying to find the underlying brain anomalies of mental disorders, drug cravings, and other mysteries of the mind. Guo and her team at the center provide the necessary mathematical muscle, devising the statistical models that can take in the vast, cacophonous universe of data produced by today's sophisticated scanning technologies— sMRIs, fMRIs, and DW-MRIs—and pull out the meaningful tidbits of information. "Imaging technology is changing so rapidly, which means the tools used to analyze it must change rapidly as well," says Lance Waller, chair of the biostatistics and bioinformatics department. "Ying is part of an initial generation of statisticians focusing on this. She is collaborating hand-in-hand with people developing the new measurement technologies and the neuroscientists working with patients to develop new analytical tools. And she is training the next generation of imaging statisticians." Being able to identify biosignatures in the brain for mental disorders would have large ramifications. Depression, schizophrenia, post-traumatic stress disorder (PTSD), and other mental illnesses are traditionally diagnosed based on patient self-report or clinician-administered rating scales, which mostly rely on behavioral assessment and sometimes result in inaccurate diagnosis. In addition, behavioral symptoms don't usually show up immediately, so the disease often progresses unnoticed in the early phase. Biomarkers identified by a brain scan could potentially translate into more definitive and earlier diagnoses and could inform treatment options. The problem is, you can't see depression on a scan. "When you scan someone with cancer, you can often see the tumor," says Guo. "You can then have some idea about where it is, how big it is, and how it changes over time. But with brain imaging, the raw data is hard to interpret directly, so we need to use statistical tools to help extract relevant information and translate it into results that can be visualized and interpreted. It's sort of like a puzzle with millions of little pieces scattered in different locations. The only way we can put those pieces together to make a picture is by developing effective models and algorithms that can do it." The task is made difficult by the sheer volume of data that a scan produces. In a typical fMRI, for example, a single brain image contains hundreds of thousands of voxels, the 3-D equivalent of a pixel. A total scan may have 200 to 500 of those single images. Because of the vast size and complexity of neuroimaging data, the model to analyze it can sometimes take days to run. The data is also very noisy, meaning that a lot of the signals from the data are not related to brain disorders researchers are interested in but rather caused by artifacts, physiological effects, or other confounding factors such as subjects' age and gender differences. Guo and her colleagues devise statistical models to analyze brain scans that can filter out these unrelated effects to reveal what anomalies are actually associated with the condition being studied. Tanja Jovanovic is assistant professor of psychiatry and director of the Grady Trauma Project, which studies PTSD in a civilian, inner-city population. Guo and her colleagues, Amita Manatunga and Limin Peng, work with Jovanovic on several studies involving brain imaging and PTSD. In one study, Jovanovic used Guo's models to validate previous findings. Earlier studies had linked a PTSD patient's difficulty in controlling fear and anxiety with less activation in the control region of the brain (frontal and prefrontal cortex) and weaker connectivity between the emotional region (amygdala) and the control region. However, traditional statistical approaches to analyzing brain scans are often difficult to replicate, so there is less certainty that abnormalities discovered were, in fact, linked to PTSD versus being random. "Ying's stringent statistical models allow us to have more confidence in our findings," says Jovanovic. In another project, Jovanovic and Guo's team are trying to develop brain imaging biomarkers associated with different PTSD symptoms, such as avoidance, numbing, and hyperarousal. "If we are able to find such biomarkers, treatments might be able to be better tailored to meet the specific needs of patients," says Guo. Often called the "long goodbye," Alzheimer's disease afflicts more than 5 million people in the U.S. Guo used fMRI data from the Alzheimer's Disease Neuroimaging Initiative to track how brain connectivity changes over time. She compared brain images from people with Alzheimer's, those with mild cognitive impairment, and those in a normal control group at baseline, six months, and 12 months. She was able to identify connectivity decreases between the sensorimotor and auditory networks and also between the default mode and auditory networks among the Alzheimer's patients. 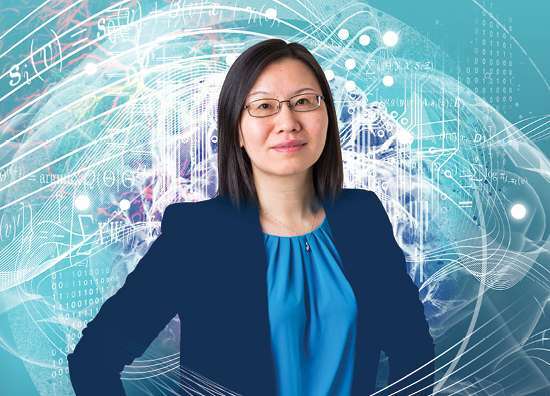 Guo and her team used those findings to build a predictive algorithm that can help forecast the rate of connectivity decline among various brain regions. "Our model takes into account each subject's unique brain features, so it is individualized for each patient," says Guo. "This tool could help forecast the progression of the disease, which could be useful in treatment planning." In recent years, researchers have started using multiple types of neuroimaging—sMRI, fMRI, DW-MRI—in an attempt to get a more complete picture of a mental disorder. Traditionally, each separate type of scan required a separate analytical tool to parse the data, but mental disorders are not so neatly contained. "A mental disorder may impact the brain in different ways," says Guo. "It may affect functions, but it may also affect structural and anatomical aspects of the brain. If we could combine the information from more than one type of scan, it would have the potential to reveal so much more." Toward this end, Guo and her colleague Jian Kang are working to develop a novel statistical tool that can analyze more than one type of scan, or in biostatistical parlance, multi-modality imaging. Then those scans could be jointly analyzed on that unified platform, something akin to the overhead projectors of old, where one transparency showing the body's muscular system, for example, might be laid on top of one showing the skeletal system, resulting in a single image depicting the relationship of the two. 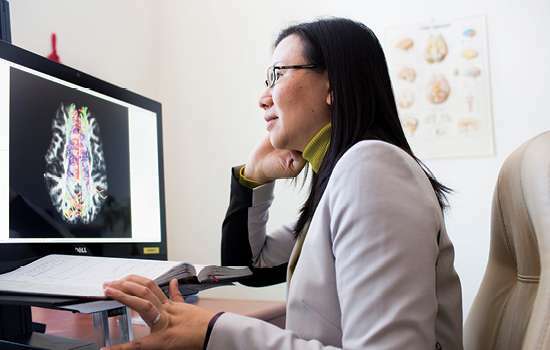 Guo is using scans from the rich imaging database of Emory neurologist Helen Mayberg, who has been studying brain-based subtypes of depression for many years, to test the new analytical tool. "Studying the brain is not linear or straightforward," says Mayberg. "My group has a lot of well-characterized data, and Ying is able to use that to develop unique statistical tools. In turn, those tools may allow our data go to the next level and to say more than we originally anticipated." Guo also is working with Ki Sueng Choi in Mayberg's lab to see if they can use multi-modality imaging to identify biomarkers for different stages of depression and to predict how well patients will respond to particular treatments. "Innovative forms of scanning data have great promise, but they need equally innovative analytic tools to deliver on that promise," says Waller. "Ying's research aims to, and does, provide those tools."